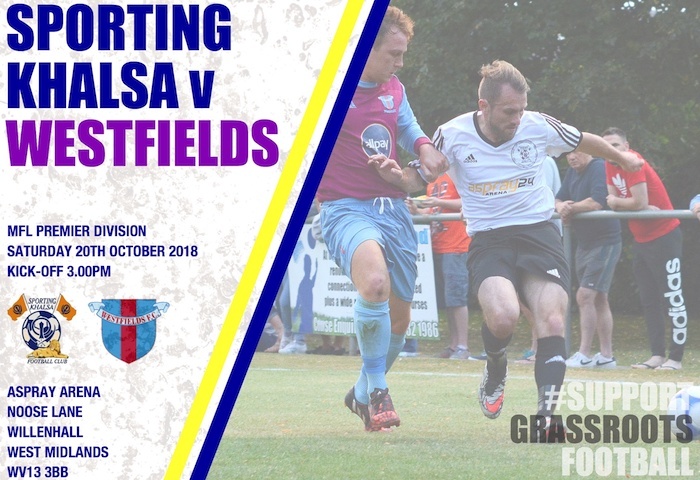 It’s 4th v 2nd on Saturday as Khalsa return to Midland Football League action and Hereford side Westfields are the visitors to the Aspray Arena. Currently sitting second, Westfields are two points behind league leaders Ilkestone and three points ahead of Sporting Khalsa, although we currently have five games in hand. Recent form has been challenging for the visitors, a 2-2 draw with in-form AFC Wulfrunians last weekend was preceded by the same scoreline at Dunkirk, a 2-0 defeat at leaders Ilkeston, a 3-1 defeat at Loughborough University and a 1-1 draw with Coventry Sphinx. The last league win was on September 8 when they beat basement side South Normanton Athletic. Goals have been coming through the team, but Ben Miller (8), Ben Hayes (6) and Jamie Molyneux (6) are all significant threats. Recent meetings between the two sides have thrown up varying results. Last season, braces for Kyle Brady and Dave Meese helped Khasla to a 4-2 win in September at the Aspray Arena before the return fixture saw Khalsa – on the crest of a slump – downed 2-0 in Hereford. For our part, Khalsa will be seeking a win which would be both a tenth win on the bounce in all competitions AND a tenth win on the bounce in the league following last Saturday’s 1-0 win in the FA Vase against Winsford.